Diaspora is the scattering (migration) and gathering of peoples. It denotes people on the move, whether involuntarily (push) or voluntarily (pull). Diaspora peoples may be immigrants, refugees, temporary workers, international students, etc. This movement of peoples has significant implications on how we view and engage in Global Mission. Mission is no longer a matter of geographical distance. The “West to the Rest” mentality no longer fits the global reality. We recognize the need to strategically engage in a new paradigm of mission that takes seriously this contemporary movement of people as God ordained for the extension of His Kingdom. “The Diaspora Initiative” is a ministry of the Tyndale Intercultural Ministry Centre in partnership with UReachToronto. Together with our partners, we seek to establish a hub for ministry to and through Diaspora. The Diaspora Initiative will provide anyone involved in ministry with new Canadian people groups access to networks, information and research data so that such organizations and individuals may further the work of the Kingdom in Canada and globally. UREACHToronto and TIM Centre will become a Canadian hub for Diaspora ministry (mostly people groups new in Canada), known for its excellence in applied research and advocacy. We seek to become a primary facilitator of dialogue, exchange and training for churches, organizations and individuals engaged in this expression of God’s Kingdom. “The Diaspora Initiative” will seek to partner with other organizations by facilitating networking, dialoging, training and providing opportunities for inter-action between people of diverse backgrounds in Canada. Representatives of the nations of the world are literally on our doorstep. Today, “Going Global” can be going to some distant land or crossing the street to befriend your neighbour. In Jesus great commission to his disciples he challenged them to be his witnesses in Jerusalem and Judea, geographically close and culturally close, to the nations, geographically distant and culturally distant and to Samaria, geographically close and (now in Toronto), culturally distant. 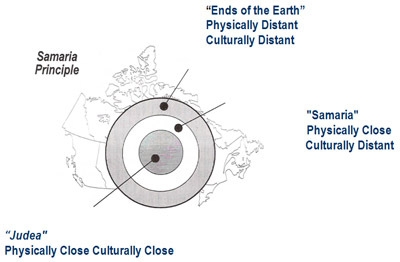 The “Samaria Principle” is a reminder that God has given the Church in Canada an opportunity to reach out cross-culturally by engaging in mission to the nations right on our “doorstep”. See our resource section for some excellent resources that will assist you and your church engage in Global Missions… to your neighbour across the street or to the “Ends of the Earth”.